A simple and easy to make dessert in minutes. It took just 20 minutes to make this from start to finish. A perfect treat when you have surprise guests or a sudden sweet craving. My kiddos love desserts, my elder one hates carrot, he runs a mile actually, whereas my lil one loves carrot, he munches them raw. So this served a double purpose, delighting both. I have used milk and sugar instead of condensed milk, if using condensed milk, avoid milk and sugar and also reduce the cooking time. Do try this delicious treat and let me know how you liked it. In a wide and deep microwave-able glass bowl, take 1 tbsp of ghee, add carrots and Microwave it high for 3 minutes. Remove after every 1 minute, mix it well with a MW-safe spoon and cook again for another minute. After 3 minutes, you can smell the carrots cooking in ghee. While the carrots are cooking, in a measuring jug, take milk, add milk powder to it and sugar. Mix it well to make thick liquid. Once the carrots have nicely cooked, add the milk and sugar mixture to it, followed by saffron,remaining 1 tbsp ghee and pounded cardamoms. Give it a good stir. Push it into the microwave and cook at high for 11-12 minutes. Stop the microwave after every 2 minutes, stir the mixture and continue. By 10 minutes or so, all the liquid would be absorbed and it will coming together as a thick mass. Keep an watchful eye and nose after this stage, it might burn pretty fast. It took 11 minutes in my Microwave to reach this stage. Take it out of the microwave now, give it a good stir, and let it sit for another 8-10 minutes on the kitchen counter and cool. Once it comes to touchable hot, grease your hands little bit and pinch ping-pong sized balls of the mixture and shape it into a peda. Garnish with cashew nuts on top and serve warm. What a simple and delicious dessert . The pedals look wonderful and carrot is a great addition . Carrot is really a great addition... looks at the lovely color it has given! Nice, quick one, Priya. 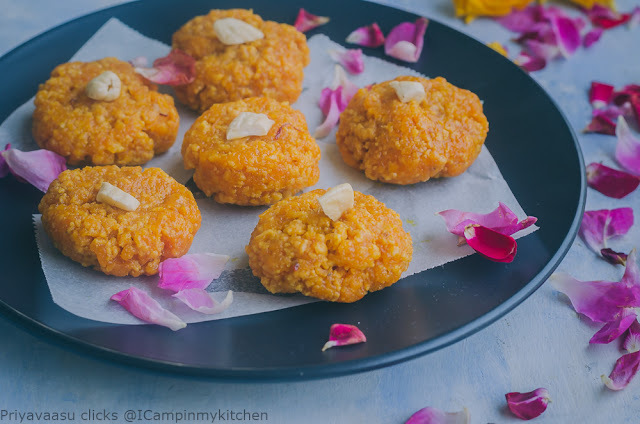 Somewhat like a cross between carrot halwa and peda. 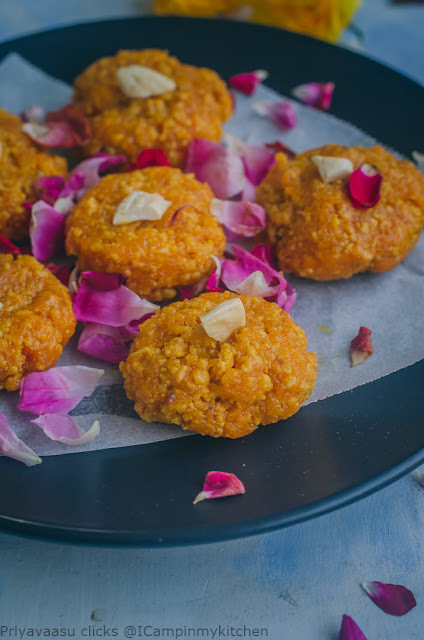 lovely colour and love the combo of carrot and peda. Love this peda with carrots. 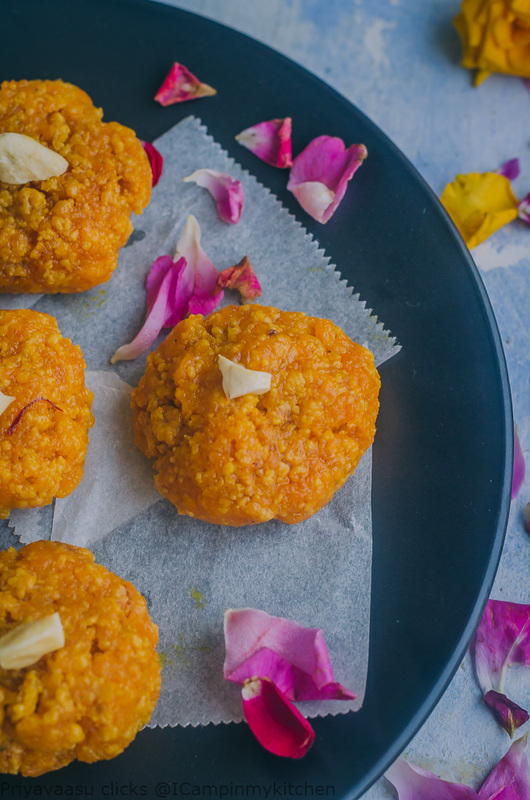 It's like a halwa but much better. I have never tried peda with carrots. Looks so tasty. The combination of carrots, milk and sugar makes an absolutely divine sweet. The pedas look so good..